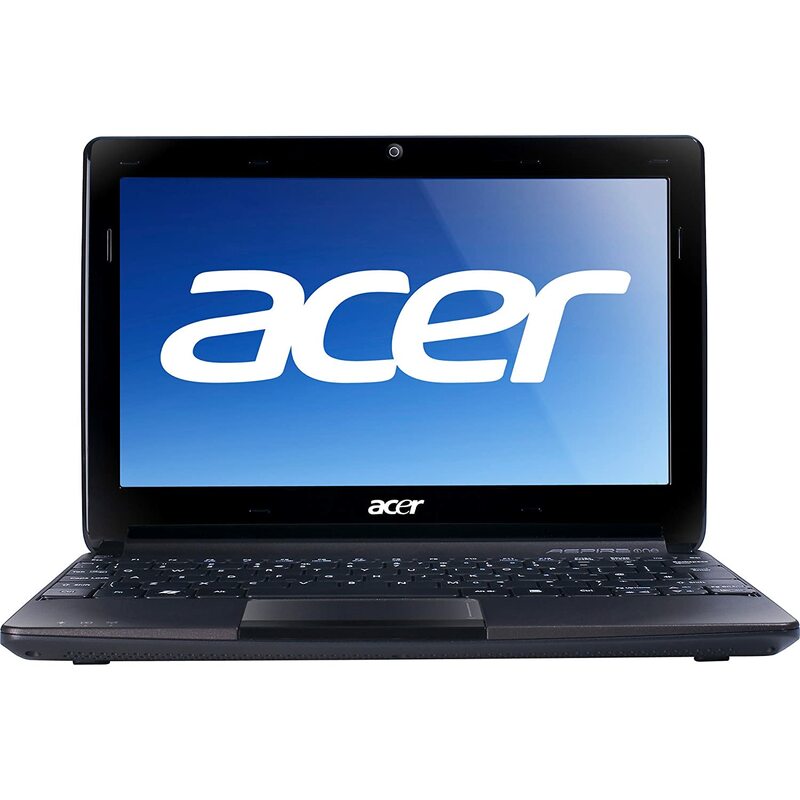 The Acer Aspire One series is an affordable line of netbooks that was one of the first ones in the market. Powered by an AMD C series dual core C-50 processor with a clock speed of 1.0GHz and 1MB L2 cache per core, the Aspire One 722-BLZ197 is a good netbook for handling all our daily computing requirements. It comes with a healthy amount of RAM (2GB DDR3) and a storage capacity of 250GB (SATA HDD @5400RPM). An onboard AMD Radeon HD 6250 chip that has a dedicated 256MB graphics memory handles graphics on the BLZ197. This accounts for some low-end gaming action, just enough to please casual gamers. The graphics chip also ensures that the netbook is able to handle high quality video playback. The 11.6” display of the BLZ197 is perfect for watching movies and videos on the go. The screen has a native resolution of 1366×768 and is branded with the Acer CineCrystal mark. The resolution is high enough to watch videos at a wide 720 HD resolution. The interiors of the laptop has a plain plastic finish with the system status LED’s on the of the left hand palm rest. The bottom has a rubbery finish for better grip on any surface. It has a Chiclet style keyboard with well-built individual keys. The key layout wastes no space and hence many of the keys have a combination of functions that can be accessed through the modifier keys. This however also ensures that every key is nice and large, especially the enter key, which makes for more comfortable typing. The touchpad is recessed in to its own area and has a single click button. It also has a dedicated area for scrolling vertical scrolling on the touchpad. The Aspire One 722-BLZ197 comes with built in webcam and a multi-in-one card reader. It comes pre-installed with a 64-bit version of Windows 7 Home Premium, which is a perfect OS for most students and the average computer user. The 250GB storage is good enough for carrying around a large bank of documents, photos and media files. Since the netbook can handle HD movies, you can carry a few around on your netbook without facing space crunch. It also comes with Microsoft Office Starter 2010, which most users would want to upgrade to a full version. Customer reviews on sites like Amazon suggest that most people upgrade to a full Office version on purchase or remove Office entirely because they don’t need it. Buyers like the 11.6” size, which is a perfect compromise between portability and keyboard space for working on the netbook. For the price point, most users like the processing speed and graphics power that they are getting with the Aspire One 722-BLZ197. The touchpad is over-sensitive for some people but this can be easily adjusted from the system settings. It needs an external CD/DVD drive to read optical media but most people end up carrying their data on a flash drive or external HDD and don’t miss the optical drive. Marvell’s New Armada Might Bring Both HD And Gaming On Netbooks, Bye Bye Atom? Marvell had their booth as usual MWC this year at beautiful Barcelona, Spain. What they had with them seemed pretty ordinary till you realized what was really going on. They had a two-screen set up, one small and another a large HDTV. The small screen had a 3D game on it and the HDTV was displaying and HD Movie. And both of them were being fed by just one little box that was powered by the Armada chipset. Armada from Marvell has the potential to completely change the way we look at Smartphones and netbooks it the future. This puppy has the power to drive up to four 2K by 2K displays all at the same time. If you think that is more than 1080p, you’re almost there — that is way more than 1080p. But there already are chips like this, right? Wrong. Because this one barely sips at the battery while doing all this. Armada can power a home theatre rig and a gaming rig all at the same time and still stay cool and satisfied with very little power. At the heart of the Armada 618 SoC is an ARM A7 design chip, explaining its power efficiency. It is capable of working with Linux, Android and Windows Mobile but that is only because they are focussing on phones. Just imagine what this can do to a netbook! Intel Atom is nowhere near this kind of power efficiency and it still can’t provide the kind of performance that the Armada 618 can do at less than that amount of power. It can finally bring HD video and gaming to your netbook and not in a 720p, 2D way. Its 3D rendering engine can render 45 million triangles per second, which is means killer game performance. If this replaces Atom, we will be living in a world of bliss (and addictive gaming on the go). The Lenovo IdeaPad s12 is a popular netbook model. It had the right balance between power and elegance and it was priced correctly as well. But the one thing that held it back was the same thing that held all the other netbooks back – the complete and utter lack of graphics prower. Thankfully, that changed after the NVIDIA ION came along. But Lenovo chose to put the ION LE version in to the S12 and hence caused it to become a minor setback. nOw that upgrade season is here again, Lenovo has decided to make amends. The main reason for using ION LE over ION was ensuring that the battery life was not hampered. But the consumers want both power and battery life and Lenovo understands that now. The company has stepped up and made the S12 into one of the first ION (full version) equipped netbooks made by a major manufacturer. It has a similar, albeit a bit lower battery life but it can now crunch HD video and handle graphics. Around the launch of Windows 7, the newly configured S12 was launched in Japan. A day later, it was made available in the US as well. The price on the website is currently $599. This is a steep price to pay for a netbook but it has only just been launched here. There is an 11 business days waiting period as well. So the right thing to do would be to wait for it to show up on Newegg or Amazon and then snipe it for a much lesser price. Given the way these things work, the price will probably come down to near $500 very soon to make it more appealing. The Mobinnova Élan has been shown off by NVIDIA for quite some time now. It is a tiny netbook that has a rather large battery compartment sticking out of it, promising a lot of power. But the main feature of this 8.9 inch portable is not that it has an extra long battery life. It is being shown around by NVIDIA because it is one of the first (probably the first) netbook to be built around the NVIDIA Tegra platform. NVIDIA’s Tegra promises to be quite a useful platform for small portables. It involves the use of a power-efficient, low voltage ARM-based processor in conjunction with a powerful graphics chip. This gives the platform the ability to have stunning graphics with low power consumption. The Mobinnova Élan was only the initial name of the portable. It is now being called the Mobinnova Beam and that is what it will be known as officially when it is launched at next year’s CES. The official word on the ultimate fate of this device is still nothing significant except for the fact that it will be tied to a carrier when it is launched at CES 2010. This device is capable of delivering true HD video at 1080p resolution. And even while doing that, it will give you a battery life of 5-10 hours. If you are playing music, it will give you a battery life of 24 hours. Well, with that really large battery case, it would’ve been slightly stupid if it did not have such a long battery life. But still, that is impressive. However, since this device is running on Windows CE, which is an embedded OS, it is somewhere between a netbook and an MID. The price is pretty right though, at $299 when it launches. HP Mini 311 becomes the first NVIDIA Ion based netbook to go on sale. It has an 11.6-inch display that HP claims to be HD. Thanks to the Ion chipset, you can now view HD movies at a full 1080p resolution on your netbook. The NVIDIA Ion chipset took some time to penetrate the market but now it is in the pipeline for quite a few manufacturers. The Ion chipset gives Atom powered devices the capability that has been missing in them so far. Ion’s video chip enables them to process complex graphics and hi-resolution videos that allows netbooks to playback high resolution videos and some 3D games. There is a trade off involved here however. The reason video and graphics was left out of the equation was because these applications demand a lot of power. The Ion chipset does not consume the same amount of power as the other, fully powered chipsets but it does consume more power than the normal Atom chipset from Intel. This is the reason why it took manufacturers some time before they could imbibe the Ion in to their netbooks. Ion is primarily aimed at the HTPC market where a compact, low-powered device that can playback HD video is highly appreciated. The chipset has already seen some market penetration in that regard. The new HP Mini 311 is currently available only from the HP website. Other than the Ion chipset, there is not much that can distinguish it from the other netbooks. Its higher resolution screen allows the user to enjoy HD movies on the go. But the Atom N270 processor is the same old fare when it comes to multitasking and other things. It has 160GB of storage and 1GB RAM. The Mini 311 starts from $400.